BIG-hearted Brazilian Jiu-Jitsu coaches based at the Girdwood Hub are offering free classes to help people suffering from mental health issues overcome their problems. Peter Lavery, Robert Cullinan, John McTasney and Ciarán Martin who all hail from the north of the city have a lifetime of coaching experience between them and Robert said they wanted to give something back. 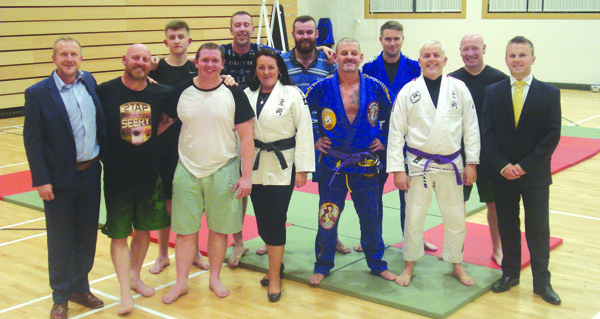 “We have been working with local MLAs Nichola Mallon and Paula Bradley for the last five months to gather support for the free coaching classes in Brazilian Jiu-Jitsu,” said Robert. Robert said having spent so many years in the gym as a coach he was aware of the benefits of exercise and wanted to pass that knowledge on to people who may not realise how much of a positive affect it could have on their lives. Official guidelines from government encourage the promotion of exercise over the prescribing of anti-depressants in some cases. “The training releases feel-good natural chemicals in the brain which elevates mood and breeds happiness,” said Robert. “Not only does consistent martial art practice boost your energy levels and psychological well-being but longer term, it is hoped that as enthusiasm for the activity grows participants will naturally migrate to become regular members of their local clubs. Brazilian Jiu-Jitsu is a martial art that focuses on grappling and ‘ground fighting’ and is similar to Olympic wrestling. It is physically demanding and is a key part of mixed martial arts with a number of UFC champions specialising in the technique. Robert is part of the Merville Brazilian Jiu-Jitsu club but says they are offering the extra classes in Girdwood as it is perfect venue for teaching the martial art, according to the coach. The studio where the classes will be taught has been designed specifically for exercise classes and all equipment will be provided. Anyone interested in availing of the free lessons can come along to the Girdwood Hub on Tuesdays from 7pm to 8pm or 8pm to 9pm. The classes are held in the upstairs studio and are open to anyone between the ages of 12 and 55 although children under the age of 18 will need consent forms to be signed by their parents. The cost of renting the facilities is being covered by Belfast City Council’s Sports Development Department.